Is Your Dog Scratching Constantly? When your pets start to scratch and you see pepper-like specks on your floor, you need to act fast. Since time is of the essence, call Truly Nolen Pest Control - Ocean County as soon as you notice signs of fleas. 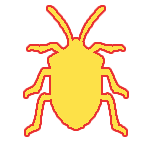 Our knowledgeable crew will respond quickly to perform flea and tick control treatments in your Brick & Toms River, NJ-area home. The faster you contact us, the quicker your pets will be relieved of their itchy skin. Whether you need bee or termite control services, the trained pest management professionals at Truly Nolen Pest Control are here to help. Enjoy peace of mind with Truly Nolen Services. Contact us today to get a free estimate on any pest control service.